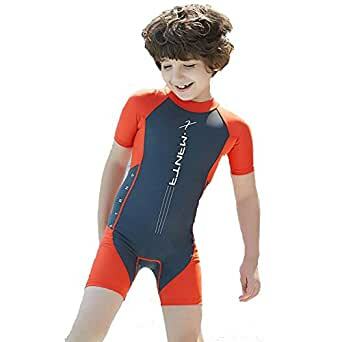 PREMIUM QUALITY — Super lightweight & Breathable Nylon & Neoprene material gives your kids comfortable feeling, chlorine resistance protects child skin. ULTRA FLEXIBLE — Made of Super-stretch fabric, making it for easy mobility. EASY GET DRESSED AND TAKE OFF — High quality #10 YKK zipper for comfort and convenience. Kingswell’s wetsuits are designed to offer a warm and free body movement for you. Made of the softest high quality neoprene fabric, let your kids swim as free as a fish.